What would you get if you paired the hottest producer in Jewish music with the most sought after band on the wedding scene, Jewish music’s brightest new star and a uniquely chosen selection of new compositions, current hits and timeless gems? Nagila V’nismicha, the soon to be released wedding album from Avi Newmark that is unlike any wedding album you have ever heard before. Avi Newmark, producer of Benny Friedman’s Taamu, Dovid Gabay’s LeGabay and Omar Dovid, Shabbos Get Ready, Yitzy Spinner’s You and I and Shea Rubenstein’s Ohavti, brings album quality music and sound to every simcha. His Nagila Orchestra continues their meteoric rise, taking the wedding scene by storm with just the right mix of songs meticulously selected for each and every simcha, top notch arrangements, flawless vocals, finely tuned sound configured to enhance not overwhelm and an elite group of musicians coordinated to perfection by a band leader who knows how to make the most of every event. 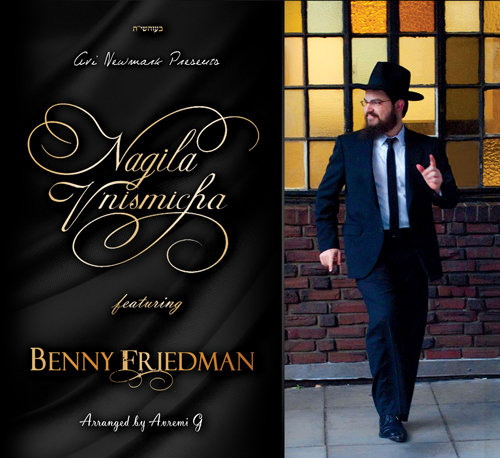 That same level of stellar leibidic music that are the hallmark of both every Avi Newmark CD and every Nagila event are what makes Nagila V’Nismicha a standout album. The talented team of professionals who make every Avi Newmark production rise above the rest contribute their talents to this album, with full arrangements by the incomparable Avremi G, dazzling vocals by superstar Benny Friedman, currently hard at work on his second solo album, and outstanding studio work by engineer par excellence Ian Freitor. Featuring a creative selection of twenty unique songs carefully culled from diverse composers including two brand new full length songs, the finished product is an album that combines the excitement and energy of a live event with a level of musical perfection that can only be achieved in a studio setting. Stay tuned for more details on Nagila V’nismicha, which is sure to redefine the phrase “wedding album” forever!